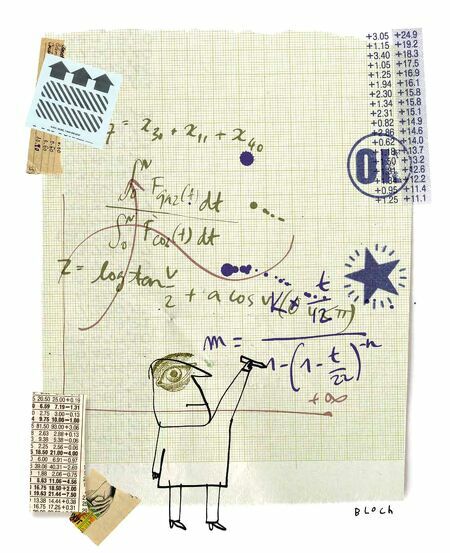 Doing the Math: Four Math Concepts that Could Change How You Do Business By Holly Munson Illustrations by Serge Bloch Jeremy Charlesworth could see the skepticism on his client’s face. She didn’t say it, but he knew what she was thinking: You’re wrong. Charlesworth, a research analyst for The Nielsen Company, had been asked to recommend a name for the client’s new product. At first glance, one name stood out. Then Charlesworth started digging into the data and doing the mathand, according to his analysis, the initially appealing name wasn’t so appealing: it carried the risk of cannibalizing the company’s other brands. But his client was unconvinced. “I felt so dejected,” Charlesworth says. 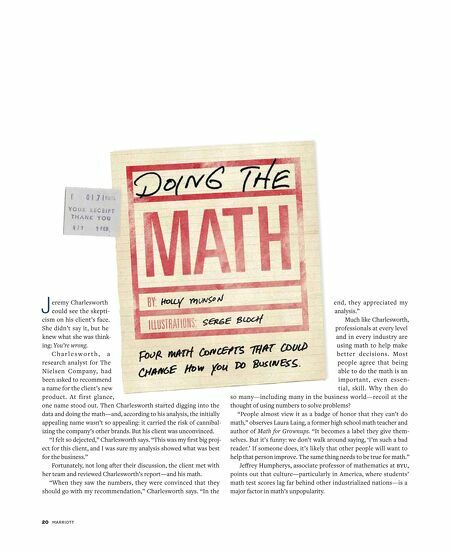 “This was my first big project for this client, and I was sure my analysis showed what was best for the business.” Fortunately, not long after their discussion, the client met with her team and reviewed Charlesworth’s report—and his math. “When they saw the numbers, they were convinced that they should go with my recommendation,” Charlesworth says. “In the end, they appreciated my analysis.” Much like Charlesworth, professionals at every level and in every industry are using math to help make better decisions. Most people agree that being able to do the math is an important, even essential, skill. Why then do so many—including many in the business world—recoil at the thought of using numbers to solve problems? “People almost view it as a badge of honor that they can’t do math,” observes Laura Laing, a former high school math teacher and author of Math for Grownups. “It becomes a label they give themselves. But it’s funny: we don’t walk around saying, ‘I’m such a bad reader.’ If someone does, it’s likely that other people will want to help that person improve. The same thing needs to be true for math.” Jeffrey Humpherys, associate professor of mathematics at BYU, points out that culture—particularly in America, where students’ math test scores lag far behind other industrialized nations—is a major factor in math’s unpopularity.